Yesterday’s “Take a Hike!” adventure explored yet another segment of the Prescott Circle Trail. After parking at the intersection of Thumb Butte Road and the road to Camp Willow Springs, we started walking on West Trail #318 at an elevation of 6,020 feet. After one-half mile we connected with Javelina Trail #332 which is part of the 50 miles of trail which goes around the City of Prescott. We descended to an elevation of 5,690 feet to the chimney ruin just past an old corral. This would have been a pleasant location for a ranch as it is near Willow Creek which offered clear water and soothing gurgling sounds. This segment of trail is about 1.7 miles long. On our return trip of approximately 2.2 miles we made note of the following wildflowers in bloom: Arizona thistle, birdbill dayflowers, bluebonnet lupine, common mullein, curlycup gumweed, Dalmatian toadflax, fall tansyaster, fetid goosefoot, shorthair goldenrod, small-flowered globe mallow, spreading fleabane, western yarrow, whiteflower prarie clover, Wright’s deervetch, and Wright’s thimblehead. Arizona has wonderful wildflowers! On Sunday we hiked on Goldwater Lakes Trail #396 which has an elevation of 6,160 feet at the trailhead where we parked near mile post 4 on the Senator Highway. 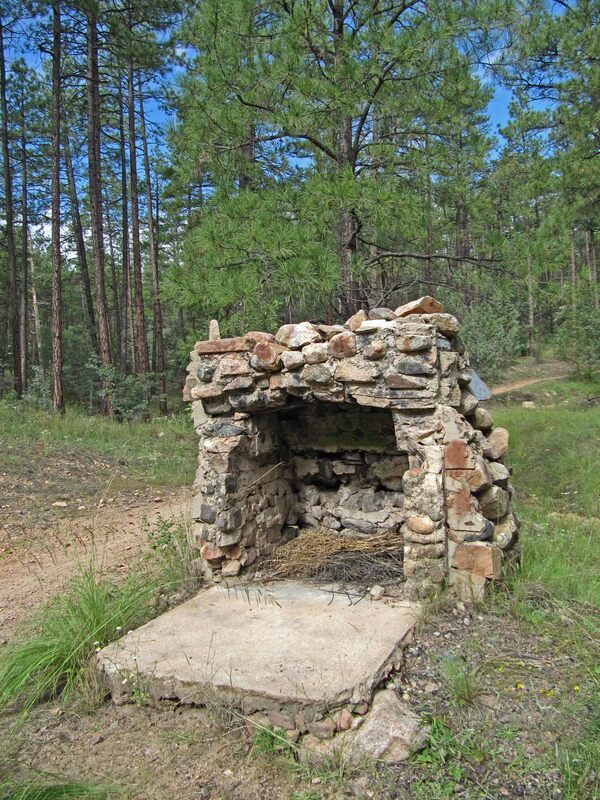 This trail is also part of the Prescott Circle Trail and ends near the White Spar Campground. 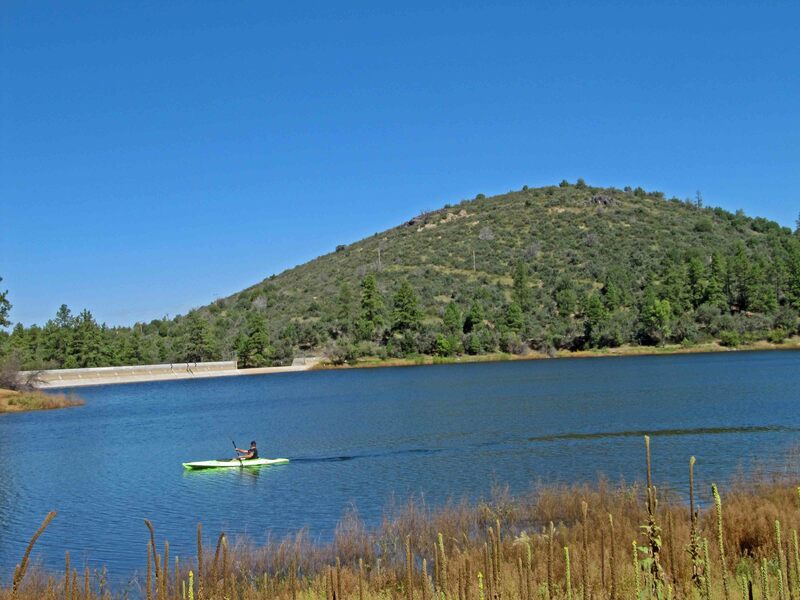 We traveled about 1.5 miles before returning using a bypass trail for closer views of Upper Goldwater Lake. Upper and Lower Goldwater Lakes are reservoirs held back by dams. The lower lake was completed in 1923, the upper in 1932. At one time they provided 83% of Prescott’s water. They were named for Morris Goldwater, the uncle of Senator Barry Goldwater. Morris was the mayor of Prescott a number of times, first in 1879 and he was instrumental in improving Prescott’s water supply. On Saturday we hiked 1.8 miles on Wolverton Mountain Trail #9415 before returning to where we parked near the White Spar Campground off Highway 89. The trail, part of the Prescott Circle Trail, meandered through an open pine forest gently rising from 5,620 feet of elevation at the trailhead. There was no shade for the half mile after we crossed Forest Road 9707V. Our turnaround point offered outstanding views of White Spur Mountain, Thumb Butte, and Granite Mountain. We could even see the San Francisco Peaks. Wildflowers including curlycup gumweed, whiteflower prarie clover, fragrant snakeroot, western yarrow, birdbill dayflowers, Navajo fleabane, silvery lupine, fall tansyaster, and common mullein were abundant along the trail throughout our hike.. 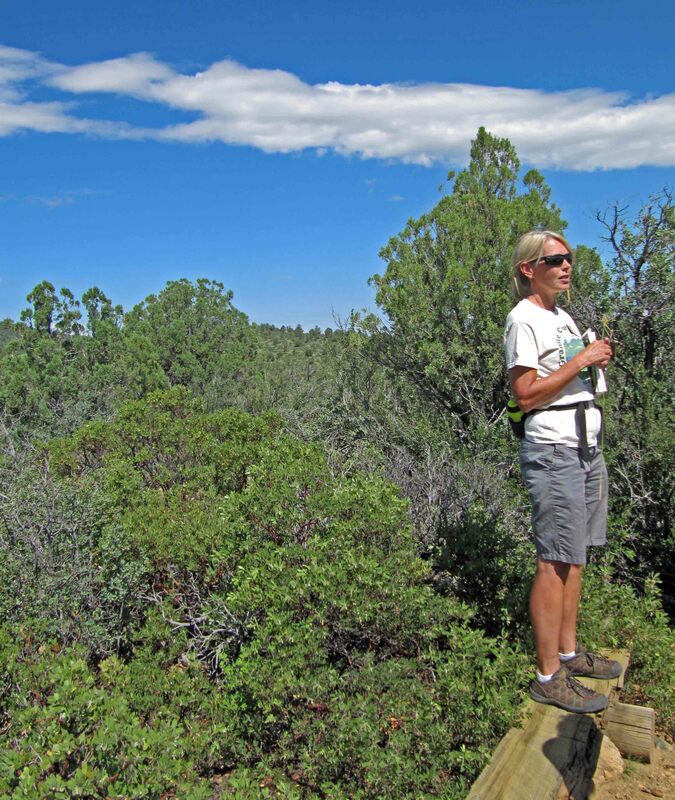 Yesterday was the kickoff date for the 2014 Prescott Hiking Spree also known as “Take a Hike!” We participated in a naturalist led hike of 2.3 miles along what was titled the Gold Pan Loop Trail. From the Highlands Center for Natural History we started on Highlands Trail #442 which took us through the woods to Lynx Creek where gold panning is possible. We observed an individual who appeared to be walking down the creek with a large bucket which was probably held his pan. We then walked up Forest Road 9401 to the intersection with Homestead Trail #305 which we used to return to the the Highlands Center. The trails were lined with wildflowers that our naturalist identified for us. Prior to our hike Sam Frank, Central Arizona Director of the Arizona Wilderness Coalition, presented a program about his organization’s work in supporting the Wilderness Act which was officially signed into law by President Lyndon Johnson fifty years ago on September 3, 1964. Arizona has 90 Wilderness sites administered by four federal government agencies. It is important to maintain this country’s wilderness areas, and it may be important to take action to grow these areas. Tony Hiss has an article on “The Wildest Idea on Earth” in the September issues of Smithsonian that highlights E. O. Wilson’s argument for setting aside half the land just for wildlife. The article features the philanthropy of M. C. Davis to revive the ecosystem of the Southeast who purchased 50,000 acres as a nature reserve. Too bad some of the country’s other richest individuals are spending their money on regressive politics that support their greed rather than for the wider public good.